I’ll be proudly putting my Moto Guzzi California Vintage’s police motorcycle heritage into action as a motorcycle marshal in the Bike MS Breakaway to the Beach bicycle event in September. About 12 of us rode the course on a practice ride last weekend from the greater Charlotte, North Carolina area to Sunset Beach, NC via Florence, SC. As usual, I was the only Moto Guzzi rider in the bunch. Our group consisted of 5 Harley touring (ElectraGlide, Ultra Classic and Road King), 2 Victory customs, a BMW, a Kawasaki Vulcan 900, a classic Honda GoldWing 1100, and an awesome GoldWing trike motorcycle bringing up the rear. 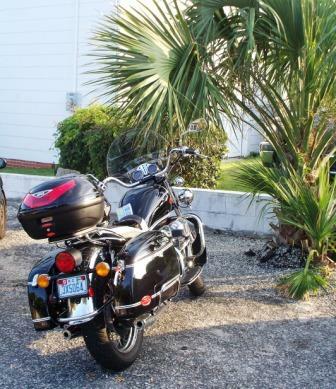 It’s always fun to get asked questions about my Moto Guzzi California Vintage. The usuals are “what is it?” and “I heard about them but never saw one before”, “where did you find it?” and “are they still in business?”, etc., etc. It’s actually a great conversation piece, and a great motorcycle too. 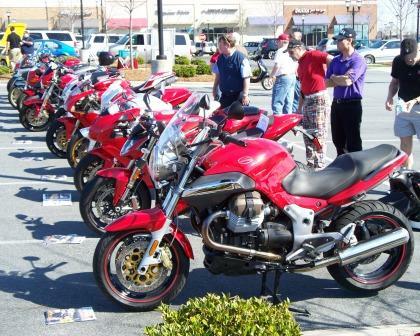 Too bad they are such an oddity here in the USA, but I guess that helps keep us Moto Guzzi owners rare birds (actually eagles, or is it geese?). 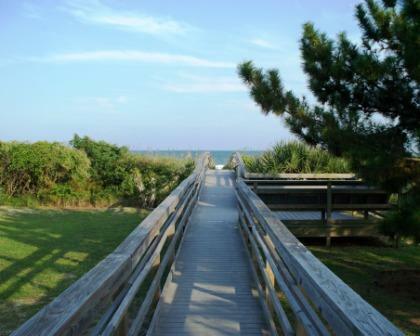 Normally, a ride from Charlotte to the beach would take about 4 hours, but because we followed the planned bicycle route for the MS event, it took just about the entire day to get to the beach. 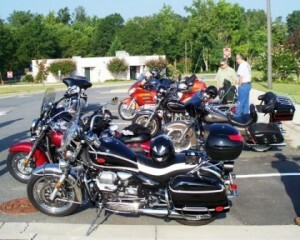 We started out with stop for a big breakfast, then a stop for a big lunch at Cracker Barrel, and had several (welcome) stops for fuel, restroom and a chance to get out of the saddles for a few minutes. We spent a lot of time on extremely rural and beautiful country roads of South Carolina. Jim, our fearless lead rider and annual organizer of the motorcycle marshals, had the course programmed into his GPS. But even so, there were more than a few times where the GPS messed-up. All that practicing of tight u-turns that I did in the MSF course really paid off on those narrow country roads! The ride to Florence was very scenic and sparsely populated. We rode for a long time without seeing any town or gas station. 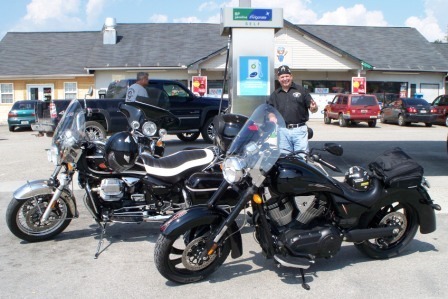 It really gave me time to relax and just ride without any of my usual working-world worries, except for one thing… my low fuel light had been on for a really long time and there still were no gas stations in sight, or any towns for that matter. To conserve gas, I even began to pull the clutch in and let it idle on the longer downhills. Finally, we made it to the outskirts of Hartsville, SC to a gas station. As it turned out, I wasn’t the only one that had been riding on fumes. Luckily, none of us actually ran out of gas, but I sure learned my lesson for next time. Fill up with all 5 gallons! That was a new record for me for how long my low fuel light was on. Hopefully, this is not a record that I’ll be trying to beat anytime soon. 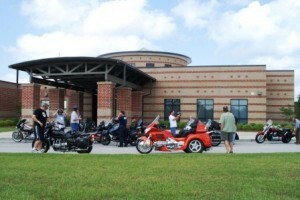 Hartsville was a nice town to ride through. We rode near Coker College, named for Major James Coker, founder of the college and of the multi-billion dollar Sonoco packaging company. The tree-lined streets and beautiful old Georgian-style buildings on the campus were a welcome site after a long hot ride on the SC back roads. I noticed several historic markers on the road through the campus and tried to get a glimpse of them as we rode through. 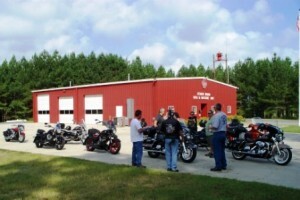 Our group met up in Florence, SC for lunch and to join our second group that rode in from Camden, SC. After a very hot ride the long way to Florence, those hard wooden chairs at Cracker Barrel were pretty harsh on my backside, but my lunch was good – we were all pretty hungry. Because this is my first time to be a motorcycle marshal, I am trying to absorb and learn as much as possible, especially knowing that there will be upwards of 2000 bicyclists in the event that will be counting on us to help keep them safe and pointed in the right direction. I have a ton of respect for all the folks that will attempt to ride a bicycle that far and raising lots of money to help fight MS. Some of those roads that I saw are going to be quite a challenge. Keep in mind that this is coming from a guy that never rode a bicycle more than about 10 or 15 miles at a time. On this practice ride, I also experienced first hand that I can count on my fellow motorcycle marshals to ride safe and to take this event seriously. We rode in a pack the entire way there and back without any issues at all. 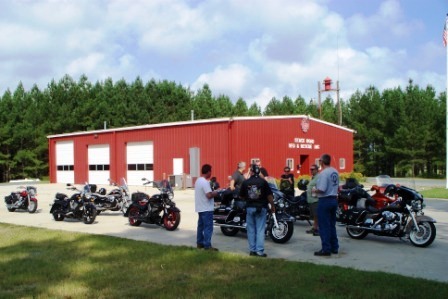 Using hand signals, pointing out the pot holes and road debris, and just checking with each other to make sure all is well and that the pace was good for everyone, is what made it a very enjoyable group ride (in addition to the Carolina scenery). I felt we worked as a good team and I believe we will do well for the MS Breakaway to the Beach participants too. A few things I am thinking about for being a motorcycle marshal is that (1) the Moto Guzzi California Vintage has no hazard lights, just as a lot of other bikes also don’t have them. It seems strange that this isn’t standard on all motorcycles, but then again, I haven’t had to think of this until now. (2) I wear a full face helmet, which might be challenging to talk to the participants if I need to, but I’ll stick with it. (3) I may add a brake light flasher to my motorcycle before the event, just to help cars see me better if I end up having a line of traffic behind me. We all know impatient car drivers can get when they are stuck behind bicycles, and I don’t want anyone riding my tail. 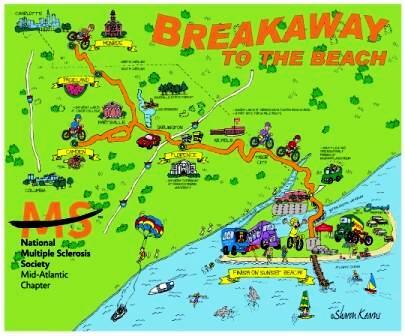 Of course, each motorcycle marshal will all be wearing a reflective vest and will have a special sign to identify us as being associated with the MS Breakaway to the Beach event. Let’s hope the regular traffic will give us a brake, and if not, we’ll be working to make sure they do. Mark, thanks and man, you are right! I felt like I had two red hot pokers poking me for days after. We wondered where you went Sunday morning, you missed a good breakfast buffet in Little River. Glad you made it back safe. What a great find your GL1100 is, I really like it. See you on the 25th. Hey – great write up! I think you nailed it on the head, but definitely underplayed the soreness of our butts (at least in my case!). I had the GL1100 and took the more direct route back to Greensboro. I took 904 W and it was a great road in the morning, not having seen more than 5 or 6 cars the entire way. From there, I meandered my way to 220 to I-73 and flew back. The old ’82 held up well and ran strong. I too have no hazard lights, but the vests and signs should help out. I look forward to the marshaling and seeing everyone again! John, Enjoyed the post and seeing such a cool Motoguzzi close up. I’m looking forward to the event in September. Ride safe!